Bio-Geotechnologies for Mine Site Rehabilitation deals with the biological, physical, chemical, and engineering approaches necessary for the reclamation of mine waste. As mining has negative effects on natural resources and deteriorates the quality of the surrounding environment, this book provides coverage across different types of mining industries, which are currently creating industrial deserts overloaded with technogenic waste. 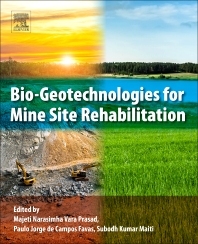 The book offers cost-effective strategies and approaches for contaminated sites, along with remediation and rehabilitation methods for contaminated soils and waste dumps. It is an essential resource for students and academics, but is also ideal for applied professionals in environmental geology, mineral geologists, biotechnologists and policymakers. Dr Maiti is an award winning author in Environmental Engineering. His area of focus is mining and the environment for most of his career. He has published 3 books, 89 journal papers, 14 book chapters and over 100 proceedings. He is Professor of the Department of Environmental Sc. & Engg (ESE) at the Centre of Mining Environment Indian School of Mines. He acquired his Ph.D (Env Sc. & Engg., ISM), M.Tech (Envt Sc. & Engg, IIT Bombay), M.Sc (Botany, Calcutta University), Mining & Env (Univ of Luleo, Sweden), EIA & Auditing (UK), SERI (Australia), FNEA, and Mem IPS (USA).